There are already signs that spring is on its way, with the first shoots of bulbs poking through the ground and even the odd blossom on the trees. Spring is a wonderfully romantic season to get married in, bringing with it the promise of summer after a long, harsh winter. A spring wedding allows you to take your pick from a plethora of flowers. You can go wild with flowers in your hair and on your dress, decorating the wedding venue and even brightening up your wedding cake. You can indulge yourself with pretty colours and take your inspiration from nature to get creative with your theme. There really is no limit to what you can do when you get married in spring. We’ve put together a list of spring-themed ideas to get you started with planning your spring wedding. Spring is traditionally the time when people start to host garden parties and there’s nothing like teacups and roses to create an elegant, sophisticated mood. Use teacups as an unusual alternative to vases to hold your roses. Scour second hand shops or bidding sites to source pretty teacups at a reasonable price – they don’t have to match! Who doesn’t love a piece of sumptuous, seasonal lemon meringue pie? Make an impact by serving your pies in jam jars to create a rustic effect. You don’t have to stick to traditional bouquets on your tables. Tying blossoms and blooms to antlers or driftwood is an original way to display flowers and every display is completely unique. You could even paint the wood or antlers to complement your theme. Try contrasting bright flowers against plainer colours. 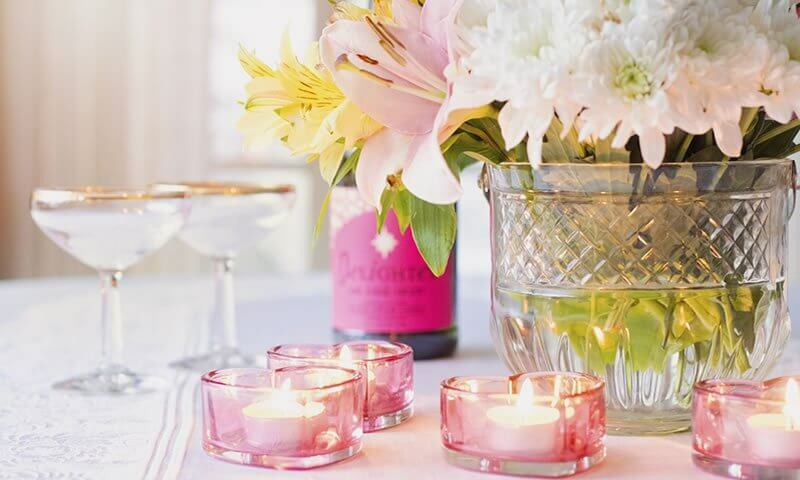 It’s customary to greet guests arriving to your ceremony with a drink, which is the perfect opportunity to introduce your theme right from the start. Homemade lemonade is wonderfully refreshing, but whatever drink you decide to offer, put a sprig of lavender in it – it smells beautiful and it’s perfectly edible too! You can incorporate spring themes on your wedding invitations as well, using pressed flowers to brighten up the page and give each guest a unique invite. Continue the theme with your seating plan and table numbers. A spring wedding usually means that you have perfect weather for an outdoor ceremony – not too hot and not too cold. Make a change from boring chairs by lining up hay bales for guests to sit on while you exchange your vows. Throw over some quilts or blankets and they’ll blend in perfectly with your theme. With Easter falling in the middle of spring, eggs are a quirky way to mark the season. You could dye egg shells to match your theme and use them as the base for your floral arrangements or give away miniature chocolate eggs as favours. If your fiancé is willing, why not go for lighter colours and fabrics for his suit? A pastel blue or pretty pink tie would go perfectly with a light grey suit. If you can’t decide whether to use candles or flowers as centrepieces, why not use both? Place a single bloom underneath an upturned glass and use the base of the glass as a candleholder. You could match the colours of the flowers and candlewax for an unusual conversation starter. Baby’s breath is such a pretty flower and inexpensive as well. Gathered together in jam jars, they create a stunning effect for very little cost. Alternatively, daisies are frequently overlooked yet are so beautiful. Why not tie some together and display in a soup can or colander for that bucolic feel? If you would like a more sophisticated look, a single tulip or two in a thing vase is very elegant. Wildflowers are ideal for spring weddings, as they proliferate through the countryside at this time of year. With so many colours to choose from, you can have a bouquet to suit whatever theme you like. Create a rainbow effect with multiple flowers or keep it simple with just one or two shades. You could even use a small branch of cherry blossom for something that’s truly seasonal. Sliced lemons, limes or oranges are stunning. Use them to line glass vases for your flowers to give them a burst of spring colour. Spring weather gives you so many options when it comes to your dress. Be playful with your choice of material and go for something made out of lace or tulle, perhaps decorated with feathers. You can use a floral theme in your accessories as well as having bouquets everywhere. You can find some stunning vintage floral purses and bags online – and they make great gifts for your bridal party too! Petals strewn across the aisle are visually stunning, and transform an outdoor space into something special, while a floral garland is easy to make and would look beautiful hung over the spot where you’ll exchange your vows. Hiding flowers in unusual places, such as tied to your cutlery, can also be a thoughtful touch. Pink candy floss is an unusual way to bring spring colour to your wedding and it doubles up as a delicious treat everyone will love. Try setting up a small candy floss stand in a vintage trolley for some unique decoration. The last thing you want is for your guests to be bothered by bugs during your celebrations. Make sure you have plenty of insect repellant on hand. This doesn’t mean you have to destroy the mood with boring practicalities, however. You could hang little baskets about the venue with bottles of spray inside – pretty and practical! If you love the idea of a floral theme, why not include your bridesmaids in it? Instead of going for dresses in a single colour, use floral prints for your bridesmaids. With so many pretty designs available, you’re sure to find something they’ll all love. If you prefer a simpler design, pastel colours are good for a spring wedding. If you like the idea of giving something back to nature as part of your ceremony, you can make birdseed wedding favours in the shape of hearts as a thank you to all your guests. They can take them home and hang them outside to feed the birds. Kippure Estate in County Wicklow, Ireland, is the perfect place to be creative! Talk to us NOW about your ideas.